Alex Turner has said Metallica headlining Glastonbury does not "add up". 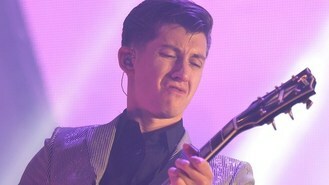 The Arctic Monkeys frontman has hinted he doesn't think the Somerset event is the right festival for the veteran US rockers, who will headline the Pyramid Stage on the Saturday (June 28). Speaking to Time Out, when Metallica's performance was just rumoured, he said: "I'm not sure it adds up. "I know we'd buzz off it, but fundamentally could you have Metallica in the hippy nucleus?" Metallica were announced on the line-up earlier this month, after much speculation, and will be the first thrash metal act to headline in Glastonbury's history. Alex also spoke on his own experiences at the legendary event, saying of the first time his group performed there: "I did the stone circle thing. I was dressed as a crocodile because Lily Allen had a load of fancy dress costumes. I remember wrestling James from Klaxons in the mud as the sun rose." Glastonbury runs from June 27 to 29 at Worthy Farm in Pilton, Somerset. Acts at this year's event include Arcade Fire, Kasabian, Dolly Parton, Jack White and Elbow. Quincy Jones has said the release of Michael Jackson's new posthumous album is all "about money". Lady Gaga has slammed music stars who lip sync. Radio 1 DJ Greg James said the crowds can look forward to a "big party" at the station's forthcoming Big Weekend festival. Sir Paul McCartney has apologised for "letting my fans down" after cancelling his tour of Japan because of illness. Guitarist Laurence Juber has created a photo book about his career, highlighting the years he spent with Sir Paul McCartney's band Wings. Choirmaster Gareth Malone is to be honoured at the annual Silver Clef Awards, alongside figures from the pop world such as Pharrell Williams and Paloma Faith. Calvin Harris apparently wants to persuade Victoria Beckham to resurrect her dance music career. The King of Pop and a likely successor, Justin Timberlake, ruled the Billboard Music Awards in Las Vegas.